Oranges are my family’s staples. Chiffon cakes are my favourite snacks. Both of them come together to make a delightful dessert for my family. To make chiffon cakes successfully, it’s not that difficult than I thought. All I need is to make sure the egg whites are properly beaten and folded in well into the batter. I’m particularly fond of its light-as-cotton texture. 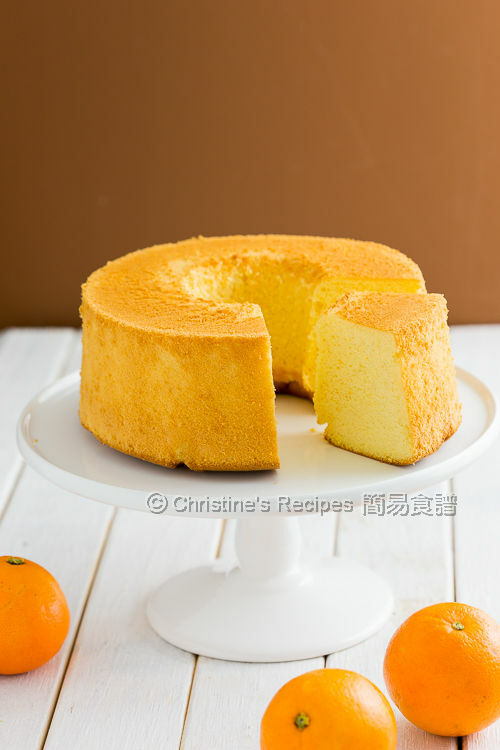 The chiffon cake is not too sweet, yet very fragrant and delicious. 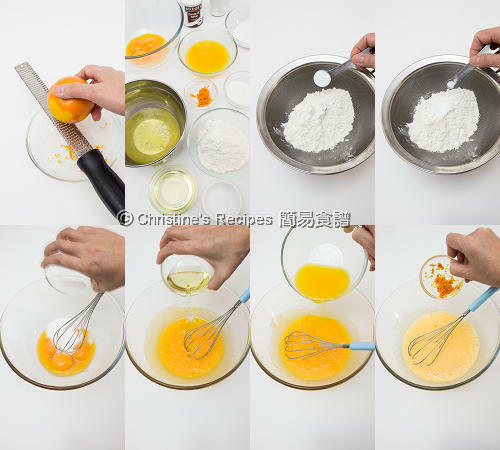 When it comes to making an orange cake, as fresh orange juice is to be added, it’s a good idea to taste the orange you’re going to use first and feel how sweet it is, as the sweetness of every orange is quite different. Then adjust the sugar yielded in the recipe accordingly. You might want to produce every cake with the same sweetness level every time. I recommend to use fresh orange juice with no sugar added, from supermarkets instead. Yield: One 20cm / 8 inch round removable based angle cake mould, not greased. In a large mixing bow, combine the egg yolks and sugar. Stir in the oil, orange juice and orange zest. Add the flour mixture in 3 batches. With a spatula, fold-in the beaten egg whites into the batter in 3 batches. (Note: please refer to this video "How To Fold-in Egg Whites.) Pour the mixture into the cake pan and bake in the preheated oven for 15 mins. Reduce heat to 160C / 320F. Continue to bake for 20 to 25 mins, or until cooked through. A needle comes out clean when inserted in the middle. Remember to taste your oranges and feel how sweet they are before making this cake. Adjust the amount of sugar accordingly. You can use fresh orange juice with no sugar added from supermarkets instead in order to control the sweetness of your cakes about the same every time. hi, my angle cake mold is 10 in. how to add in measurements for each ingredients? Chiffon is always a favourite! Yours looks tender, soft and airy! 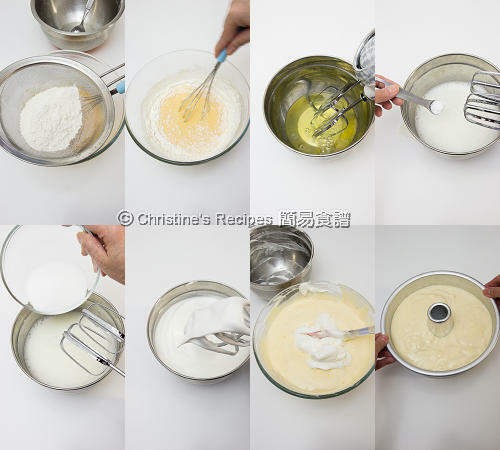 Hi Christine, I wanted to try this chiffon cake because I don't have not non stick mould so thinking to get one, but in NZ I only can find the one with size 23cm, so how to add in the measurements for each ingredients for 9 inches (23cm) cake tin? as I know you said multiply by 1.5 would you mind to give the example? as I'm new in baking so not really get it, thanks in advance. All other ingredients are increased 1.5 times. I haven't used your mentioned flour. If it's mixed with other flour, it's not suitable for making this cake. What you need is pure flour with low protein content, about 7％ to 9％ that is called cake flour. Check the ingredient labels of the packaging. Or you might simply use 80gm of plain flour and 20gm of corn flour to substitute the 100 gm of cake flour. 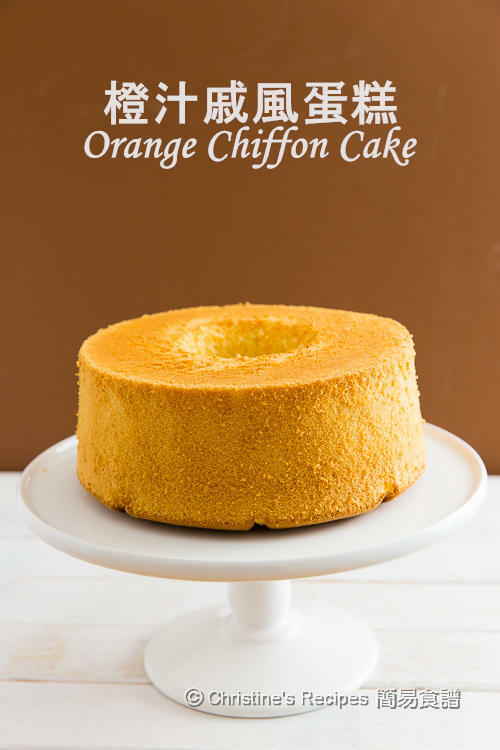 Hi Christine, I managed to get the cake flour as well as the aluminium tube pan and have tried making this orange chiffon cake and it turned out beautiful and taste absolutely soft and nice. thank you so much for all the instructions you provided, just have one question about the aluminium tube pan, I think when I washed it I have scratched some areas of the pan, is not that bad but I can see clearly the scratches, just wondering if this will affect the result of cake to be rise properly when I'm doing my next chiffon cake? because I never use aluminium type of baking tin. thanks in advance. A few scratches won't affect the end result of your cake next time. Just a little reminder. Just soak the whole cake pan in your sink overnight, you can easily clean your pan with a soft sponge. Hi Christine, We tried making your cake and it turned out very soft but as soon as we inverted it onto the rack it sank. It didn't look as airy as yours. Do you have any suggestions? I've put up some tutorial videos on youtube, how to beat and fold-in egg whites. Please check the links on the sidebar on this blog. These are the basic steps to make a chiffon cake successfully. Thanks Christine, We will check the links. The only pan we had was non-stick. We haven't been able to find an aluminium one yet. Could that have affected it? Chiffon cake tends to shrink once it's cooled down. If not using a non-stick pan, it'd help it climb higher and not easily collapse. You may try ebay. There are a lots of aluminium chiffon cake pans for sale. Thanks for sharing this Christine. May I ask if is it OK to substitute with the bottle orange juice instead of fresh juice? If yes should I reduce the sugar? Sure, it's ok to use bottled orange juice. Please beware that some brands might have higher sugar contents. So adjust the amount of sugar accordingly. I have a 18cm chiffon cake mould., will it be too small? You mentioned that we can substitute cake flour with 80g plain flour + 20g corn flour. Is the corn flour same same corn starch? You can use corn starch for making this cake although both of them are not exactly the same. Is it with shell or not? It won't hurt too much if you keep using 5 as you need enough egg whites to produce airy texture. Hi Christine, thanks for your reply today i bought some smaller eggs with shell weighing 66g each. I used 5eggs, and i ran out of vake flour, so i use 80g plain flour 20g corn flour. Wow! the cake turned super soft and fluffy. I am very happy with the result. Appreciate your sharing. Thank you. Will try out your sponge cake recipe soon. Fantastic! Congrats on your success. I have tried your recipe and it turned out really great,soft and fluffy..
Glad to know that you had a success. Hi Christine, do you take the cake out of its mould immediately or allow it to cool in the pan then wait for it to "fall" gently onto the rack? My cake deflated when it cooled down. I left it in the pan to cool down. I took the cake out from the oven immediately and inverted the pan (i.e. turn it upside down) and let it cool down completely. You don't need to grease the chiffon pan. Thus, the cake won't fall out. This recipe is super good! My first time making chiffon cake and it was super fluffy and yummy thanks for the great recipe! Wonderful! Congrats on your success. Thank you so much for sharing this recipe. I've tried countless time on making chiffon cake and I'm disappointed by the outcome. I've tried your recipe and I finally succeed and the chiffon is so soft and spongy! My family loved it! Yay, congrats on your success! Can the orange juice be switched out with lime juice or lemon juice? It can't be swapped with the same amount, as lime or lemon juice is way sourer than orange juice. I've got a lemon chiffon cake recipe on this blog. You can search and take a look at it. What can i subsitute for cream of tartar? Cream of tartar is the best to stabilize the whisked egg whites. If it's not handy to you, you might use 1 teaspoon freshly squeezed lemon juice or 1 teaspoon distilled white vinegar instead. Christine, thank you very much for your response. 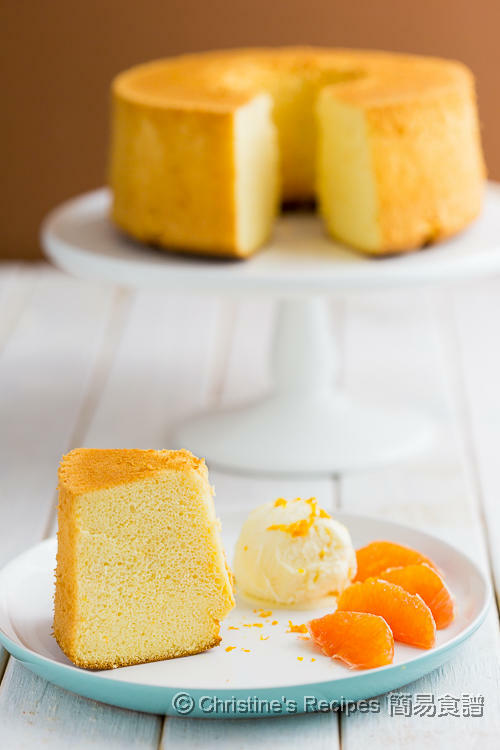 This is definitely one of the best orange chiffon cake that i have come across. The cake is soft, fluffy and moist. Love it. Would you any recipe for Pandan chiffon? Great to know that you tried and loved this recipe. Yeah, got a pandan chiffon cake recipe here.